I remember shopping with my mum and dad in what I think was one of, if not the first, Tesco supermarkets in Church Street. I see it is still there. Isn't it amazing to think that when it first opened people were amazed by its size and range of products. I also used to be sent to the Co-op which was near the toilet block and had to remember our divi number, 049771. As a teenager I used to get all my fishing needs from (I think) Benwoods and have my hair cut two doors along. This page was added on 17/01/2015. In 1968 as one of Tesco's youngest trainee managers, I spent some time at Tesco Church Street. It was orignally an Anthony Jackson's Foodfare, prior to their takeover by Victor Value. 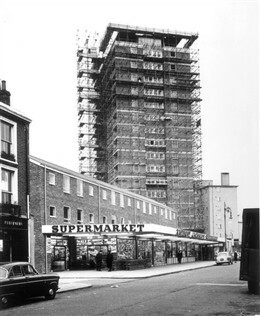 The store was converted to Tesco in early 1968 and had a "grand opening" by tv personality and DJ Simon Dee. I have some particularly fond memories of this store and rank it as my second favourite of the many Tesco stores I worked in. (My favourite was Uxbridge, a then brand new store, where I met my wife). Also liked the Regency Milk Bar in Edgware Road: Britain's greatest ice creams!